If you are looking for a new kind of PC gaming mouse, the ROCCAT Kone AIMO is something that might fit on a wishlist. It is basically the Kone model mouse with various updates and AIMO. It has the Owl-Eye optical sensor that is goes up to 12,000 dpi, has a 32-bit ARM MCU and memory to remember sittings, there’s the four direction Titan wheel built into it, and it has a tri-button thumb zone with an easy shift button that lets you have two actions assigned to each mouse button. 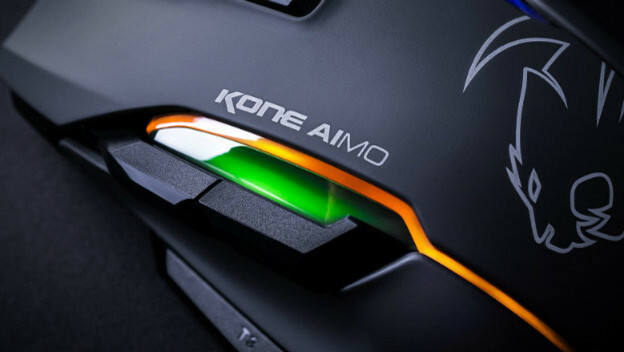 As for the AIMO, that part of the name comes from its illumination system that intuitively changes its color based on what is happening on your computer. It connects across devices and has multiple zones that can each have their own lighting display. You can get a ROCCAT Kone AIMO for $79.99.